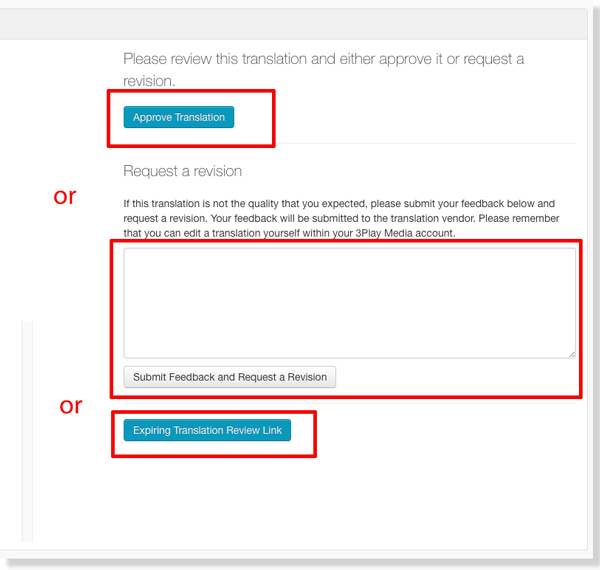 If the Gengo Translation Review feature is enabled within your translation profile, all translations will be sent to the Review Translations state upon completion of the translation process. Here is some more information about Gengo's quality policy. IMPORTANT NOTE: If the Gengo Translation Review feature is enabled, all translations will be sent to the Review Translations state where customers can either approve the translation or submit feedback to Gengo. Translations will be in Review Translation state for 168 hours (7 days). During this timeframe, feedback can be sent to Gengo to request that Gengo make edits. This process can be repeated up to 3 times. Once this review period has ended, or, if you have not enabled this feature, the translations will automatically finalize. If Translation Review is not enabled, translations will automatically complete and feedback will not be able to be submitted to Gengo. Need a third party to review a translation? Enable the Expiring Editing Link module to send a remote URL for an individual translation to a third party so they can review a translation without having to access your 3Play Media account. See Step 1 of this article for how to activate the module. After logging into your 3Play Media project click Review Translations within the Activity section of the My Files page. Click Review Translation for the translation request that you want to proofread. Once the Review Translation interface opens proofread the translation. if dissatisfied, provide notes and click Submit Feedback and Request Revision. Enable the Expiring Editing Link (EEL) module to send a remote URL for an individual translation to a third party so they can review a translation without having to access your 3Play Media account. If the Expiring Editing Link module is activated, follow these additional steps to create and send an Expiring Translation Review Link to a 3rd party person. Select a time when the Editing Link expires: 4 hours, 12 hours, 1 day, 3 days, 1 week, or 1 month*. Because revisions must be submitted within one week of the translation being in the review state, DO NOT CHOOSE 1 month. Once an expiration time is selected, click Create Expiring Editing Link. Copy the link, and share with desired parties to allow them to review the translation.